Barton Rovers suffered a thumping 6-0 defeat at local rivals Bedford Town in their Southern League Division East clash on Tuesday night. The game had been fairly open to start with, as the visitors had chances, with Danny Talbot’s low drive well saved by Kyle Forster. Bedford started to get on top, with former Barton player Tommy Hull going close before they had the lead after 26 minutes, ex-Luton Town striker Paul Benson directing a free kick past Matt Finlay. Rovers had a glorious chance to equalise when Andrew Phillips capitalised on a mistake by Devante Stanley, as he raced clear but couldn’t beat Forster. Back came the Eagles though, as David Manu’s attempt was deflected over, while Benson was prevented from scoring his second, when his header was brilliantly palmed away by Finlay, who then had to get down to save from Steve Gentle. However, the hosts went 2-0 up in the 39th minute, when James Peters took aim from 25 yards and his shot nestled into the bottom corner. Three minutes later Bedford were firmly in the driving seat when Jimmy Hartley pushed the ball into the Barton area and an unmarked Lee Roache was on hand to pass the ball past Finlay. There was no let up from Bedford in the second period as Manu’s cross was met by Benson, Finlay stretching to tip the ball over. Home keeper Forster then had a let off as he came out of his area only to miss his kick and see the ball strike his hand. He escaped with a yellow card and the game was then well and truly won for the Eagles in the 56th minute when Roache bagged his brace with a header. A flurry of substitutions from both sides interrupted the flow of the game, but still Rovers were defending, Benson seeing a lot shot saved by Finlay, who also claimed a header. 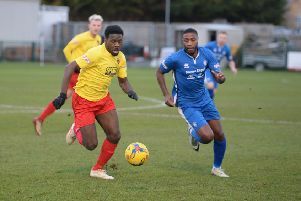 Late on, Bedford started to run riot, as Andre Olukanmi found Stanley who slotted past Finlay. In stoppage time, Brad Woods-Garness rose high to head the ball over the line and complete another miserable night for Barton. The Sharpenhoe Road club remain second bottom in the table, although are 12 points ahead of basement side Arlesey Town. This weekend they head to Ashford Town who are 12th and with no realistic chance of making the play-offs.